Though today crowded by office and commercial space, the plain, long and low "Old South" was a majestic ship of a building, mastering the swells of colonial Boston's hills. The order of the colonial town was evident from the town's skyline. Steeples rose above the masts of ships, beneath them government and commerce were conducted. Old South's influence in colonial Boston is difficult to overstate, it was the town's largest meeting space, and was usually free from the state's control. It was the home of the rally before the Boston Tea Party, and where the community commemorated The Boston Massacre. In 1776 the British gutted the church for use as a riding arena and stable. Its Flemish bond brick exterior is relatively unadorned, allowing its focus to be on its brilliant 183 foot steeple, which is punctuated with bull's-eye windows, and a belfry. Its somber clock, installed in 1776, still keeps time with its original mechanism. The church's Georgian style is evident on the balustrade square tower, arched windows and overall symmetry. 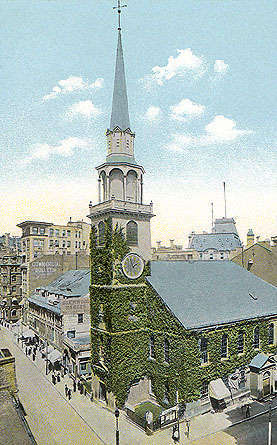 In 1869, the congregation of the Old South Church arranged for the sale of the valuable land beneath downtown meeting house, and relocated to its current home. The 140 year old structure was set to be torn down. Instead, Old South fomented yet another revolution. Luminaries such as Ralph Waldo Emerson, Julia Ward Howe, and Wendell Phillips took to the Old South pulpit to raise awareness and funds to preserve the building from demolition. The successful effort made this the first U.S. building to be preserved because of its historic and architectural significance.